The No. 3 Jumbos’ season ended in the 109th minute of play against the No. 19 Brandeis Judges this weekend, when senior forward Patrick Flahive capitalized on a poorly cleared ball, scoring from 30 yards out. Tufts played Sunday thanks to its shootout victory over No. 23 Johns Hopkins the previous day. Hosting the Blue Jays at Bello Field on Saturday, the Jumbos faced their toughest challenge to date. Coming in at 16–1–3 overall, Johns Hopkins started off the game on the right foot, out-possessing Tufts for most of the first half. Unlike Tufts’ previous opponents, Johns Hopkins was comfortable playing the ball out of the back. Whenever the Blue Jays’ senior goalkeeper Bryan See possessed the ball, he looked to pass through his center backs, who pulled wide to the edges of the penalty box. Junior center back Cole Rosenberger expertly started attacks from his left side of the field. His technical ability appeared to surprise the Tufts forwards, as he strode by the outstretched legs of their high press. The Blue Jays were successful in passing the ball through the midfield and into the Jumbos’ half, but that’s about as far as they got, registering just one shot in the first frame. The hosts’ tremendous defensive effort, led by its co-captains — senior defender Connor Coleman and junior defender Sterling Weatherbie — staved off wave after wave of Johns Hopkins attacks. Senior defensive midfielder Tyler Kulcsar played only 20 minutes due to a tweaked hamstring, but first-year midfielder Calvin Aroh filled in superbly, winning the ball and distributing to his teammates. The Jumbos relied mainly on set pieces and counterattacks to create chances early on. They clearly missed sophomore midfielder/forward Gavin Tasker, who often provides marauding runs down the left flank. Tufts’ biggest chance of the first period came with 12 minutes left, when a corner from sophomore midfielder Jack Delaney found the head of Coleman, whose header narrowly went over the crossbar. The second half began similarly to the first, with Johns Hopkins dictating play. The Blue Jays had multiple chances, as senior midfielder Drew Collins rifled a low shot that whizzed right by the left post. After the initial barrage, however, the tide began to turn toward the Jumbos. The Jumbos began to impose their muscle on the more diminutive Blue Jays players, out-fouling them eight to three in the second half. The Jumbos’ excellent fitness was on display as the game wore on: while Johns Hopkins seemed to tire and lose steam, Tufts appeared to improve. Tufts also increasingly played through first-year midfielder Travis van Brewer, whose footwork and passing calmed the Jumbos. In the 57th minute, sophomore midfielder Zach Lane won the ball on the outskirts of the box and found senior forward Kevin Halliday, who opted for a low shot that barely troubled See. The next 25 or so minutes were back and forth; Tufts and Johns Hopkins rank No. 2 and No. 3 in average goals-against, at .051 and .287 respectively . Both teams generated excellent scoring opportunities in the final minutes. With 11 minutes to go, Zinner won the ball at midfield, dribbled past three defenders and ripped a shot on goal only to see it sneak past the post. Two minutes later, a Blue Jays player fired a point-blank shot that was blocked by Coleman. The Jumbos had the upper hand in two overtime periods, applying heavy pressure to the Blue Jays’ defense. Three minutes in, Zinner fired a screamer on target, but See was there to turn it away. Tufts mustered five shots in overtime, while Johns Hopkins managed two. None hit their mark, however. All four Jumbos who stepped up to the mark converted their penalty kick attempts. In contrast, only one of the visitors’ shots was successful, as one hit the post, and Mieth saved another. For the second straight game, Tufts advanced on penalties, this time to Sunday’s Elite Eight matchup. Competition against Brandeis has been historically fierce, as the Judges were indicted 1–0 earlier this season and last season. The Judges entered at 16–0–4, while the Jumbos were 15–1–4, having conceded only one goal all season. Both sides created chances in the first half, but neither was able to convert. Strong winds proved to be a factor and dictated momentum in both halves. The 20 overtime minutes that Tufts had played against Johns Hopkins were evident in the Jumbos’ legs in the first half. The players looked fatigued in the opening stages, and Brandeis took full advantage. With only five minutes gone, the Judges’ winger cut in on the Jumbos’ left flank and ripped a shot toward the post that was saved by Mieth. Only a minute later, Halliday directed a header toward goal, but it was wide right. In the 11th minute, van Brewer took a free kick just outside the box, but had it blocked by the Judges’ wall. Brandeis had an opportunity in the 33rd minute, but senior midfielder Josh Ocel’s 25-yard free kick was saved by Mieth. The Jumbos again found their rhythm in the second half, as they mustered 10 shots to the Judges’ five. Woodhouse made six of his seven total saves in the second half, and the wind made it difficult for him to clear his lines. In contrast, Mieth was tested four times in the first half, and only once in the second half. The Jumbos had the best chance of the game with eight minutes to go in the first half. On a rare counterattack, Lane rode through a tackle, creating a three-on-two. His pass evaded the lunge of a Brandeis defender and fell to Rojas, but the sophomore midfielder lost his balance, and his shot was easily saved. 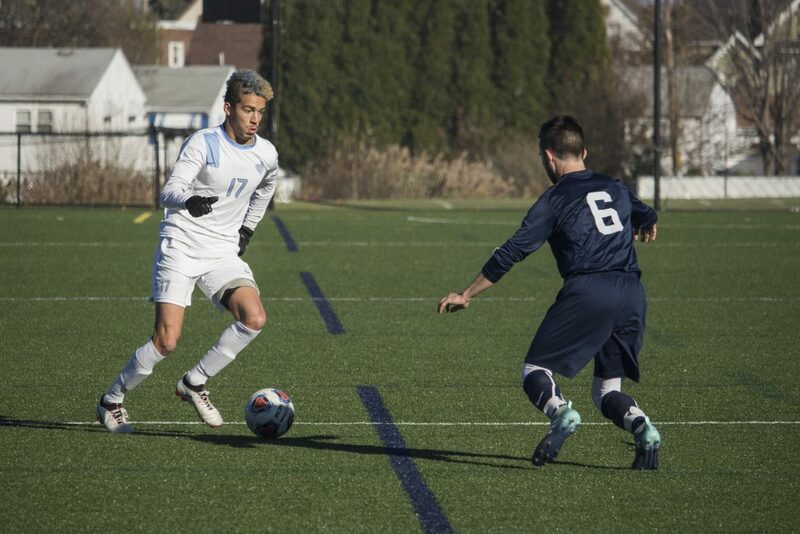 Hoping to create more attacking chances, Tufts shifted to a 3–5–2 formation in the first overtime period. The strategy seemed to pay off, as the Jumbos looked to be the stronger team in the first 10 minutes. Tufts was blessed with another opportunity to win the game with two minutes left in the period. Sophomore forward Joe Braun flicked on a free kick to Halliday, who took a great first touch and turned on the six-yard box, only to see his effort go agonizingly over the bar. In the 103rd minute, however, Rojas received his second yellow card for a rightfully called foul and was sent off, forcing the Jumbos to play the remainder of the game with 10 men. They reverted to 4–2–3–1 formation, and their attacking pressure let up. Ultimately, the 10-man Jumbos couldn’t hold out. Weatherbie motioned for Mieth to clear a ball in the box, but Mieth failed to do so adequately. The clearance rolled to Flahive, who blasted the long range effort into the open net. The loss marked the end of seven Jumbos’ four-year careers. Coleman and Zinner were forces on the back line and played decisive roles in the 2017 season. Kulscar, a three-year starter for the Jumbos, and Eichhorst ensured that the ball moved efficiently through the midfield. Both Halliday and Zazzali saw their roles shift this year due to injuries within the team, as Halliday moved from the midfield to playing as a lone striker, while Zazzali became a converted defender. Finally, senior keeper Bruce Johnson was responsible for nine shutouts earlier this season before sustaining an injury. Though the Jumbos are losing valuable assets, it is a cycle they endure every year. Based on this season’s performance — posting its best record in history despite a rash of injuries — the team will be just as strong next year.